Alley Oop was one of my favorite comic strips the 1940s and early 1950s. Alley, a Stone Age man in a fur loin cloth carrying a stone war hammer, lives in the land of Moo with his girlfirend, Ooola, and a varied cast of characters, including Foozy, who always speaks in rhyme. In 1939 the quintessential “mad scientist” Doctor Wonmug invents a time machine and brings Stone-Age Alley Oop and friends through into the twentieth century. 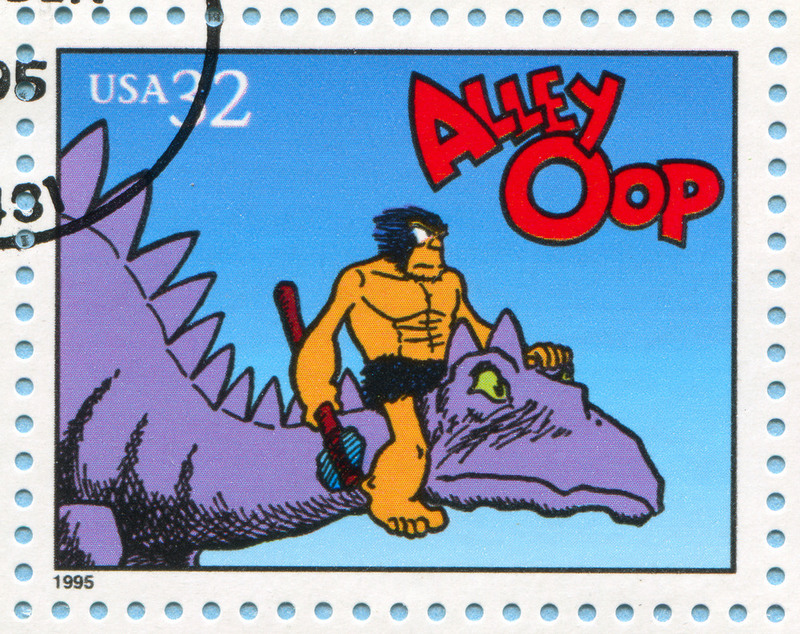 From then on, Alley and Ooola move back and forth through time, having adventures in many historical periods. The idea of time travel is firmly ensconced in our collective imagination, even though we don’t (often!) meet people from the past or future. There are inherent difficulties of what would happen if time travelers accidentally changed the outcome of some event in the past and thus forced a change in everything that happened thereafter. (Or maybe the present reality is a result of some past meddling by a time traveler. Oh, my.) And what a shock it would be to meet yourself from some future or past incarnation, if you could recognize yourself, that is! It recently occurred to me that in one sense we are all time travelers. That is, our lives are a trip through time from the moment of our birth until the time of our death. There was my “early period” as a growing boy in southern Kansas, an “early-middle period” when I went away to university and earned several degrees culminating in a PhD, a “later-middle period” when I was Distinguished Professor of Music at Iowa State University and a composer and text-book author, and now, a “late period” when Elyn and I have become travelers and adventurers over the US and Europe. Each of these historical periods has been distinctly different from the others and seems to me to be like separate lifetimes. I can revisit the earlier periods through my dreams and memories, and I can move to possible futures through my creative imagination. Perhaps what I’m saying is that we all have our own version of Dr. Wonmug’s time machine—our consciousness. I have regular appointments via SKYPE with a therapist in Santa Fe, New Mexico, named Jake Eagle. Jake has developed a radical form of therapy that he calls “Reology.” (CLICK) I’m not going to try to explain Reology in this post, but I want to describe one technique that Elyn and I find quite effective in our day-to-day lives. This is the concept of the “redo.” Say you have said something or acted in a way that has brought about tension and discord in your relationship with your partner (obviously a rare occurrence in our household!). When you realize that you have made a misstep you can call for a “redo.” Both partners must agree to allow for redos for it to work. You go back to the point of the misstep and say or do what you now know you should have said or done. The partner accepts the redo and you move forward from there. You may not believe that this will work, but our experience proves over and over that it is effective and the wounds do heal. I now see this as a sort of time travel. You travel back in time and create a new reality that works better. What if we could travel back to earlier times in our lives and do the same? Could we actually heal the past? One difficulty I see is that the other participants aren’t here now. Some have died and others have gone their own ways. While we can’t do past redos in present time and place, there might be a place where we could. That is the land of dreams and visions. Let me introduce you to the work of Robert Moss (CLICK). Moss teaches seminars in using "active dreaming" to do productive work. He has studied the approach to dreaming in many cultures. He reports that, far from our concept of dreams as “random firings” of our nervous system, most cultures have valued dreams and visions as being as important as—or even more important than—waking thought. Perhaps here is the time machine I’ve been looking for. I’m only just now beginning to work with Moss’s materials, but Elyn is deeper into his work. I’ll keep you posted on my adventures as I go there. And I would be interested in your experiences, if you choose to share them.